The submission process is closed, the Anthology is in the final proof process now. The 3rd CHWG Anthology which will feature a compilation of Mystery stories created and submitted by members of CHWG. 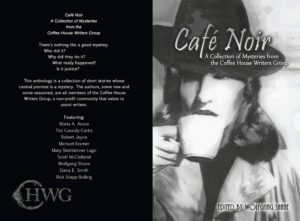 The next CHWG anthology will be about mysteries with a twist. The mystery must involve contemporary technology in some way. It can help create the mystery, be a part of the mystery, and/or solve the mystery. • Submission deadline is October 15, 2016 ( before 12:00 am, midnight) passed. We’ve gotten several submissions for the mystery anthology. Thanks to everyone who submitted work. You have another five weeks to get your stories in. I have noticed that some people are not using the standard submission format. I created a short 500 word article that describes the format that editors expect when you send them your work. If you wish to submit to the anthology, please use this format. Please submit your work with a cover letter in either doc or docx format. Thanks again to everyone helping with the anthology.